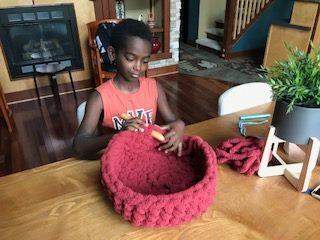 At just 11 years old, Jonah Faiso Larson has already mastered the art of crocheting and opened his own crochet business, Jonah’s Hands. It began when Jonah was just five years old. His aunt gave him a bag of old craft items and Jonah was immediately drawn to the crochet needle. After watching hundreds of YouTube videos, Jonah picked up the talent and was “hooked.” Now, Jonah crochets each morning and evening, creating anything from scarves, to potholders, to bags, and ornaments. At six months old, Jonah was adopted from the Durame region of Ethiopia and has always had in interest in giving back to the country and community. In addition to supporting Roots Ethiopia, Jonah regularly gives back to the Ethiopian orphanage from which he was adopted. Jonah now lives in La Crosse, Wis. with his brothers, Joey and Leif, and his sisters, Mary and Mercy. Jonah says he wants to share his love of fiber art with others and hopes to make more items for donation in the future. We’re proud to work with such an aspiring young artist, and we’re so grateful to Jonah for his continued support and generosity. Keep up the great work, Jonah! To learn more about Jonah, read this recent article by NPR or catch his interview live on WPR’s Ideas Network on Wednesday, February 13 at 4:15 CST here: https://www.wpr.org/listen-live?network=ideas. Next Next post: Enjoy Weezer & Improve Schools!